If something pops up for allowing SSL, click Continue to accept. Now you can go ahead and skip to Step 2 below. About 75% of the reason I fell in love with my first iPod touch was because it was more than simply a music player; it was because the iPad was the kind of device that you could utilize to enhance your life. Mail? Awesome. Contacts? Great. Notes? Not the best by Apple, but excellent alternatives like Evernote (writeup on that one to come soon) make it great. 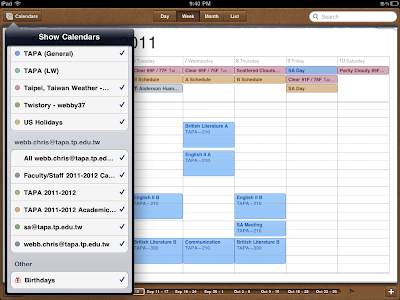 But greatest of these: Apple's almighty Calendar app. 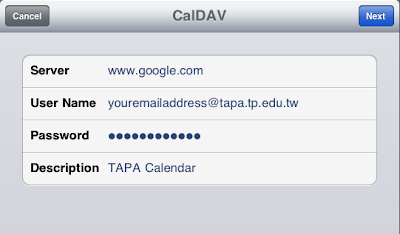 Add your TAPA Google Apps account to your iPad. (You might have already done part of this, but make sure you have everything set to make sure the entire process works.) 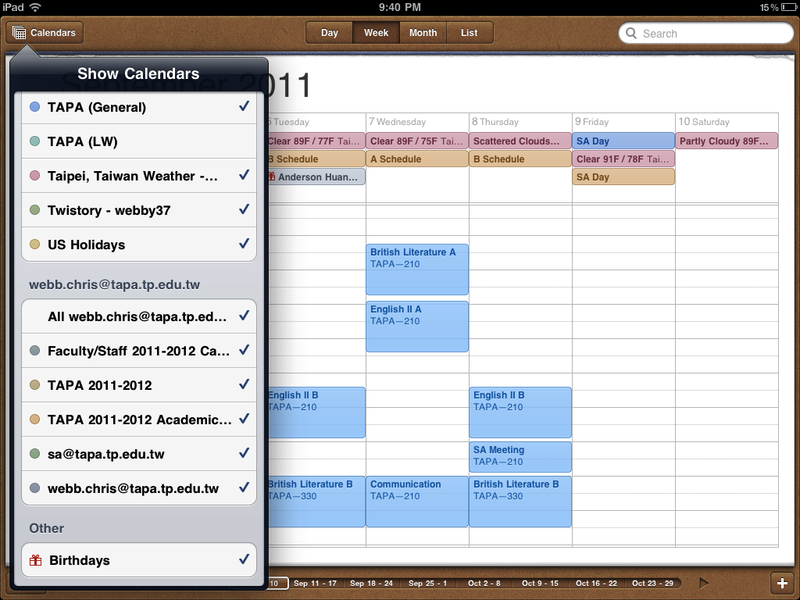 Under your iPad's Settings app, go under Mail, Contacts, Calendar. 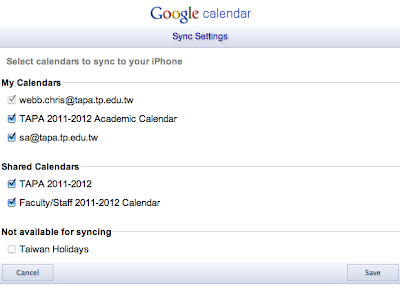 If you already receiving your TAPA mail on your iPad, you can just click on whatever your TAPA email account is (usually labeled yourname@tapa.tp.edu.tw) and make sure that Calendars is turned ON . If you do not already receive your TAPA mail on your iPad, click Add Account..., , and enter in your TAPA email information (i.e. 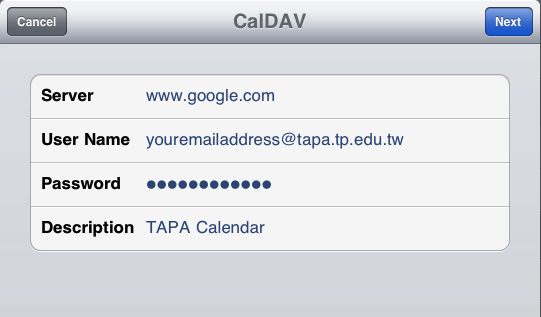 your Name, TAPA email Address, and TAPA email Password). 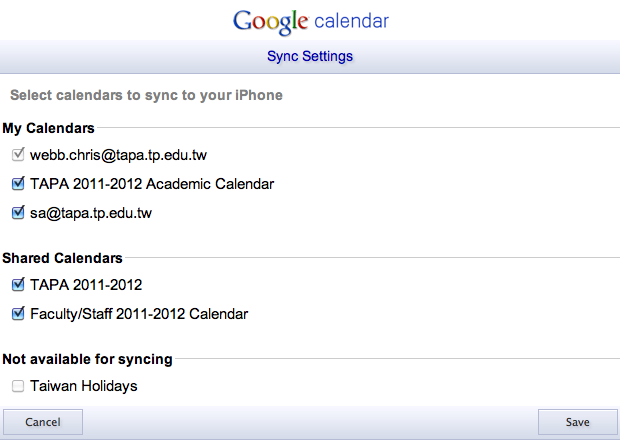 Once it successfully loads, you can turn ON your Calendars and, optionally, your Mail. There will be a series of calendars with checkmarks you can select. Click any and all you would like to be a part of (all are suggested!) and hit save. If you close the program down and re-open, your new calendar events should load. And there it is! Let me know if you have any problems with this process!